India received a modest 90 Crore ($12.54 million) Foreign Direct Investment in Defence & Aerospace sector in financial year 2017-18, the Defence Minister stated in a written reply to a question in Parliament on February 4. This investment has been received in 19 companies. The figures suggest a tepid response to the Government's effort to hike the FDI limit to 49 per cent under the automatic approval route, and up to 100 per cent with Government approval on a case to case basis where cutting edge technology is being brought to India. India's Defence Budget for 2019-20 is 3,18,931.22 crore ($44.63 billion), of which the capital outlay for new purchases of military equipment is 1,08,248.80 crore ($15.68 billion). A significant part of the revenue outlay of 2,10,682.42 crore ($29.36 billion) is also spend on repeat purchases including ammunition, spares and maintenance. Earlier, in another written reply submitted to Parliament in December 2018, the Government had declared receipts of over 438.60 crore ($62.7 million) of Foreign Direct Investment (FDI) in the Defence & Aerospace sector since April 2014. The Ministry of Defence then clarified in its statement that 1.16 crore FDI pertains to receipts under just three National Industrial Classification Codes for the Defence Sector. Inflows of 237.44 crore ($33.95 million) have been received by six companies under other codes since April 2014, the Government stated. "In addition to the six cases mentioned above, FDI of over 200 crore ($28.6 million) has been received in Defence & Aerospace Sector in 14 cases through the automatic route," it elaborated. The revised FDI limits in 2016 placed investments up to 49 per cent under the automatic route. 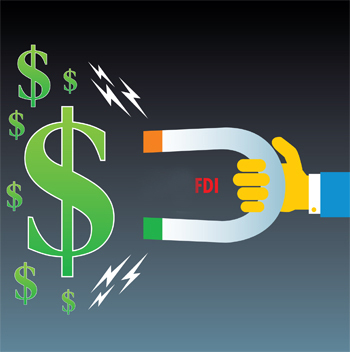 Government approval is required only for FDI over 49 per cent. In 2014, the Government liberalised the defence licensing regime, restricting the items which required a government license, and the different National Industrial Classification Codes are a reflection of the liberalised regime. These figures relate to the incumbency of the Narendra Modi Government, which took office in May 2014.